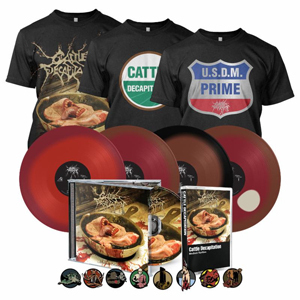 On November 23rd, Cattle Decapitation will release their new rarities collection, Medium Rarities, via Metal Blade Records. Featuring 6 previously unreleased pre-Human Jerky (1999) demos with front-man Travis Ryan on guitar (while also handling vocal duties), plus the long-sought-after To Serve Man (2002) bonus track, "Rotting Children For Remote Viewing" - in addition to other rarities (including the 6 songs from 2005's split EP with CANINUS!) - this compilation spans the band's 22-year long career and is a must-have for any CATTLE DECAPITATION fan. Travis Ryan comments: "Medium Rarities is a project we started about 10 years ago, and we're thrilled to see it finally happen! In 2008, I started compiling unreleased tracks, import bonus tracks and 7" releases for a rarities release - and even had the art created by the legendary Wes Benscoter, when we discovered that a key track was missing that we wanted to include on it. Our album To Serve Man had a bonus track ready in case there was a Japanese version released, but that never happened - and the band members' copies of the track got lost, seemingly forever! We felt a rarities compilation released without that bonus track would be a weird idea, and so the project got shelved until recently. Heather Parsons of Metal Blade finally was able to unearth the track from an old disc that was tucked away in the Metal Blade vault! The lyrics to the song were unearthed along with it, and so we quickly got to work with compiling and mastering the rest. This is a nice, concise compilation of unreleased and hard-to-find tracks, complete with lyrics and cheeky vinyl color variant schemes, based on how people like their meat prepared. The European vinyl variants also resemble diseased meats...But my favorite part is the cassette, which was created to look like the vintage cassette releases we grew up on - complete with the old school Metal Blade axe logo! A lot of thought and work went into this release, and we are pleased to finally be able to present to you...Medium Rarities!" "No Light and No Life"
CATTLE DECAPITATION will be touring in support of Medium Rarities this fall with THE BLACK DAHLIA MURDER in Japan and the USA with SUFFOCATION (for vocalist Frank Mullen's final tour! ), KRISIUN, and SOREPTION. See below for all dates!